Very nice & was easy setup. Have never had more birds in my backyard. With its trickling water and detailed bowls, the Antoni outdoor fountain works to bring you to the edge of coastal cliffs in Spain without ever leaving your backyard. 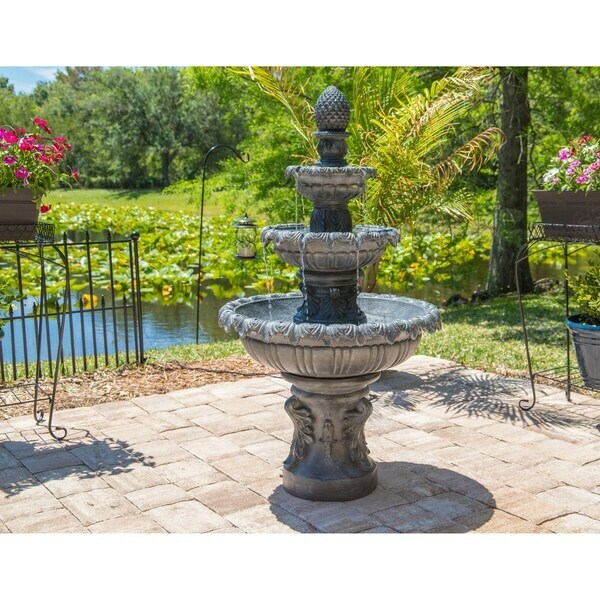 At 45-inches high, the Antoni fountain consists of a base bowl and 3-tiers that send water flowing down from one to the other. In a zinc finish, the fountain has leaf-inspired fluting along the edges of each bowl, mimicking the style all the way around, channeling the natural beauty of coastal regions into a stunning piece. At the very top of the fountain, to tie the entire piece together, rests a pineapple-shaped bubbler; bubbling the water before it flows down the fountain. Antoni is ready to find a permanent home in your outdoor space, nestled amongst tropical plants or more traditionally Spanish-inspired gardens, where greenery reigns supreme. Dimensions 25.5 In. X 25.5 In. X 45.0 In. "Does this fountain contain lights and are you able to control the water flow?"